As if one attempt at making gingerbread for the first time wasn't enough for one Christmas, I decided to try it twice. Last year I set the table with take home goody bags. I loved making them, but they were made last year when I was only working part time in between tertiary courses and actually had free time. They're also not the sort of thing you want to give away every year lest people find themselves with a stash of them. So I decided an edible take home bag was the way to go this year. I also didn't have time to make napkin rings this year, and so the idea was for them to function doubly as placeholders. I tried joining them and it became very messy. 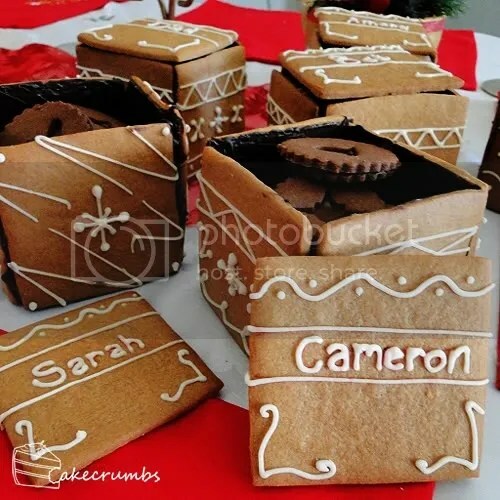 Next time I'll join them with royal icing. 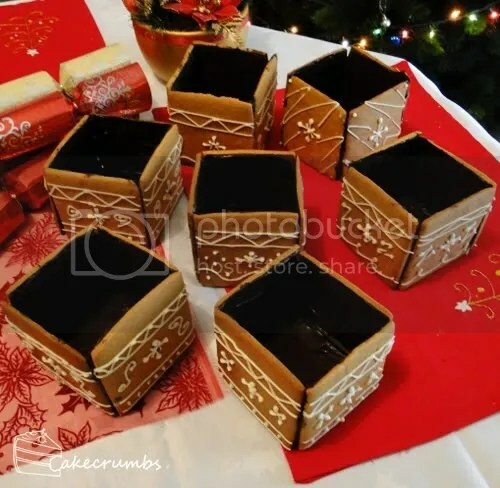 I decorated each box with a slightly different pattern, both to give a sense of individuality, and to help me keep track of which piece belonged where. Time to fill it with goodies! This is a good way to use up any leftovers of anything you may have. Bonus points for being able to make them look like something unique. Basically, everything I used was leftovers! 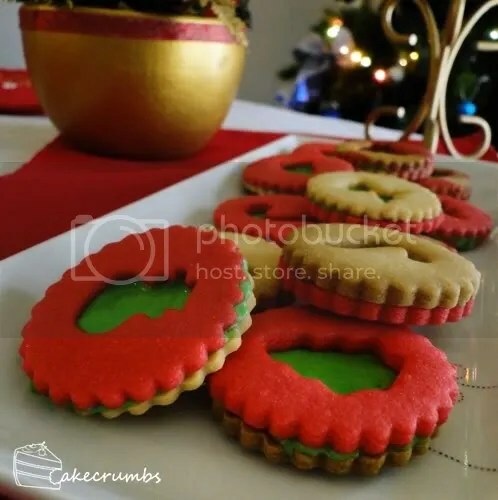 These cookies were the product of come left over cookie dough from another Christmas cookies I will show you guys soon, sandwiched with left over royal icing tinted green. The other biscuits were leftovers from the Chocolate Gingerbread, sandwiched with nutella. The truffles were made using cake crumbs from the carved out bits of the White Christmas cake, and from the second Sherry Cherry Cake that I had frozen with the intent to put to good use in some way later — decorating it seemed too daunting a task with everything else to do, so mutilating it was a much better idea. I folded the cake crumbs with everything from cream to chocolate, mixed in with various pantry ingredients: coconut, icing sugar, almonds – whatever was lying around! 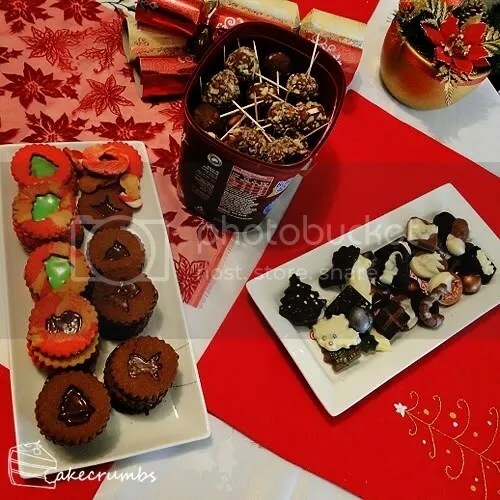 I even used leftover chocolate to make some unique Christmas chocolates. The plan for them to be “take home” goodies was more theoretical than anything. 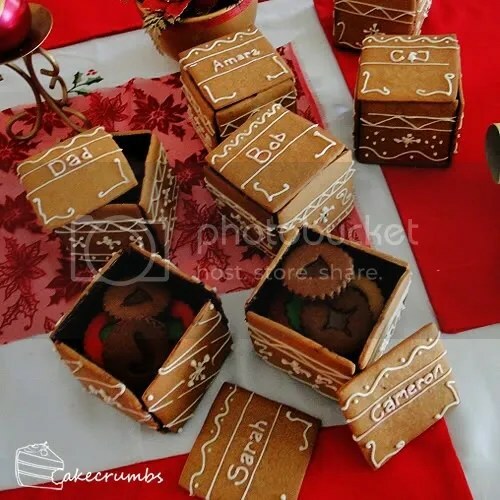 Between the 4 course feed, somehow the guests found room to squish in their little boxes and, in some cases, the entire cohort of internal goodies as well! Perhaps best, as I’m not sure how well they would have traveled being joined only by chocolate. 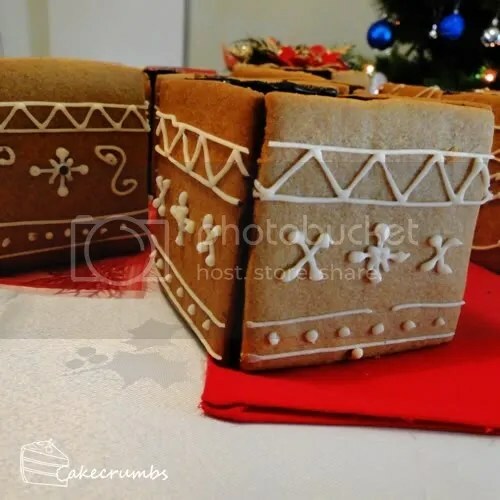 Here's the gingerbread recipe. I got exactly 7 boxes out of this recipe, but it will depend on how economical you are with your dough: I was trying to make it stretch! Cream butter, sugars and golden syrup until light and creamy; add egg and combine. Stir in flour and spices. Bring dough together and knead until smooth. Refrigerate for 30 minutes. Preheat oven to 180C (350F). Line oven trays with baking paper. Roll dough between two sheets of baking paper until 4mm thick. Cut six 8cm squares per box you wish to make. Bake large pieces for 10-12 minutes or until golden. Set aside for 5 minutes to cool before removing from trays. Whisk eggwhite until foamy. Gradually beat in icing sugar and lemon juice until a firm paste forms. Transfer to piping bag with 5mm nozzle.